his grandfather used to ford the river in the days when they used to cut hay on Reeds Island. The house and the vista radiate serenity. 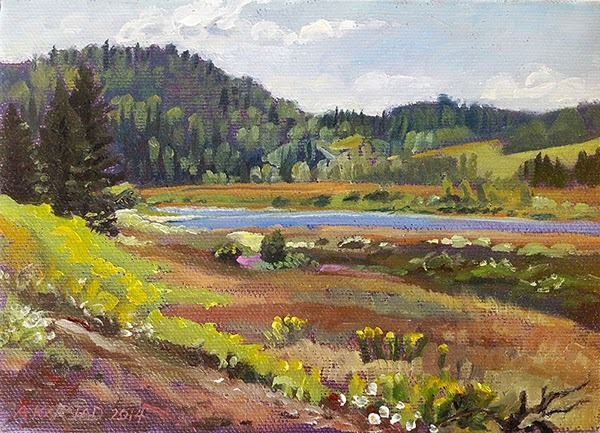 The long ribbon of the Tobique is a delightfully intense blue, and the pale empty sky in my painting gradually becomes populated by a flock of fluffy cumulus clouds that gather along the southern horizon. I chose this end of the broad view to show Cooper Mountain, one of the abrupt forested hills hereabouts. Lee tells us that one of the rumoured options is to curve the Energy East Pipeline around it and cross the river on this side of Cooper Mountain. I am just putting the final touches on the painting and signing it as Lee returns with Fred and a bag of fresh water mussel shells which they'd found along the shore and scattered on the gravel bars. At first Fred thought they were all Elliptios because of their shape (especially the little ones) though the adults did have a subtle Margaratifera-like curve to them. When the sample was spread them out in a box to dry, he noticed the lack of lateral teeth on the insides of their shells, and realized that aside from the single Lampsilis, they are all Margaritifera margaritifera. We are excited because this ancient species is so rare in Ontario. Lee told us about the little bay downstream a bit from the house where his folks used to fish for Salmon, but because of hydro dams lower on the Tobique and Saint John River, Salmon no longer run up here from the sea. 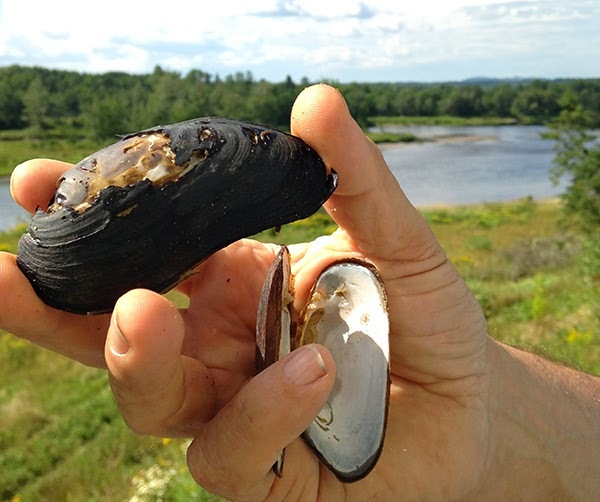 In order to reproduce here now, the Margaritifera mussels must be using Trout as hosts for their tiny glochidia, or perhaps there are "landlocked" Salmon here that never get out to the sea. While wading, Fred saw some movements that may have been crayfish, and then found the shed skin of a juvenile Cambarus bartoni. 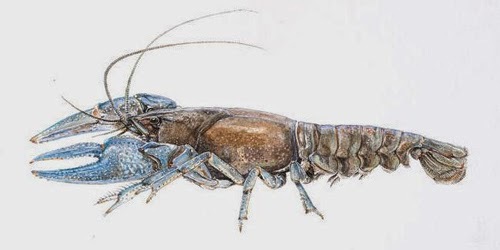 This species is very inconspicuous to people, being brown and shy, and tending to burrow, so the Reeds had not known that there were crayfish here. Recent rains have raised the water level in the Tobique, so not as much of the gravel bars are exposed, but we hope that the river will be lower when we return. I didn't get down to see the river myself today. We packed up in mid-afternoon as soon as my painting was finished, as we are expected this evening at the New Brunswick Museum's Bio-blitz headquarters near Gagetown to participate in this year's two-week all-taxon survey of the Grand Lake Meadows Protected Natural Area. I hope to have another opportunity to visit and paint on the Tobique on our return. I'm thinking "This countryside begs to be explored" as we drive south, crossing one fascinating-looking creek after another. The original oil painting, "Tobique and Cooper Mountain" is available for bidding by e-mail to support our exploration of the proposed route of the Energy East Pipeline. Please contact Aleta at karstad(at)pinicola(dot)ca. The starting bid is $300 and the auction closes at Midnight on Friday, 15 August. You may also contribute online to our independent ecological assessment of pipeline river crossings. Visit our page and share the link!